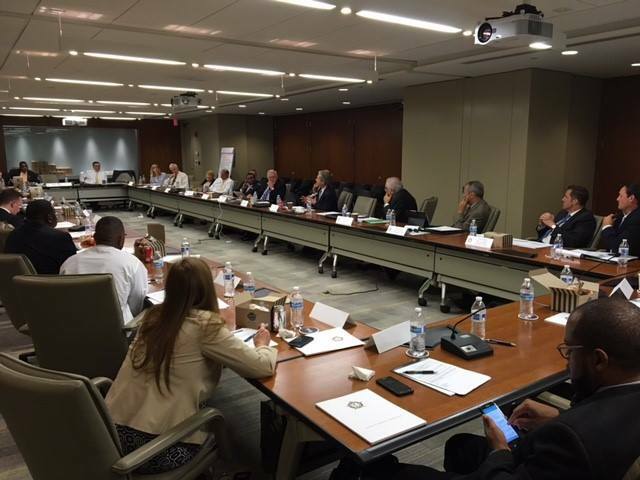 With funding from the U.S. Department of Justice’s Office of Community Oriented Policing Services (COPS Office), stakeholders from all facets of the criminal justice system were invited to the National Association of Counties in Washington, DC to share their plans and efforts for repairing the breaches in trust that exist between law enforcement agencies and the communities they serve. Last year, after several tragic events around the country, NSA invited criminal justice leaders to address issues of common concern at the NSA annual conference in Baltimore, Md. Leaders reconvened this year to share initiatives that are working to improve the justice system and share best practices. This year, more than 35 leaders from around the country talked about strategies to improve the system, including improved law enforcement training, better communication tools and more effective methods of integrating law enforcement into their communities. Dr. Lorenzo Boyd, President of the Academy of Criminal Justice Sciences returned to moderate the second Roundtable where participants collaborated to identify and develop a training tool/template to aid with the implementation of the Task Force’s recommendations within local law enforcement agencies. The White House, Department of Justice, National Sheriffs' Association, National Association of Counties, American Probation and Parole Association, Lawyers' Committee for Civil Rights Under Law, National Organization of Black Law Enforcement Executives, Santa Cruz County Sheriff's Office, Columbia, SC Police Department, National Criminal Justice Association, International Association of Chiefs of Police, Major County Sheriffs' Association, COPS Office, Association of Prosecuting Attorneys, Koch Industries, National Association of Attorneys General, Pretrial Justice Institute, University of Maryland’s Department of African American Studies, NAACP, Generation Opportunity, Justice Research & Statistics Association, Treatment Advocacy Center, Major Cities Chiefs Association, Charles Koch Institute, Laura and John Arnold Foundation, Federal Law Enforcement Training Centers and American Jail Association.